Providing you the best range of polyester geogrids, geogrids, road grid and pp geogrids with effective & timely delivery. Polyester Geogrids are manufactured by utilising a complex knitting process using high tenacity, high oriented polyester filament to provide superior engineering and long term design strength properties. Polyester Geogrid is dimensionally stable with uniform network of apertures providing significant tensile reinforcement capacity in two principle directions. The Polyester Geogrid is engineered to be mechanically and chemically stable, in both harsh construction installation phase and in aggressive soil environment (pH level 2.0 – 12.0). Polyester Geogrids are biologically unaffected by soil micro-organisms. A black PVC saturation coating provides further chemical, mechanical, as well as ultraviolet protection. Polyester Geogrid series is specifically designed for improved performance in soil reinforcement application where strength develops uni-axially. These Polyester Geogrids are either use alone or combination with other material such as segmental block, pre cast concrete panel for construction of reinforced wall and bridge abutment. Tuflex India has also developed environment friendly Ecoscape wall system as Wrap-around facia facilitating facial accelerated vegetation growth along with erosion control. Polyester Geogrid along with Biaxial Geogrids are used for construction of reinforced steep slope using wrap around, galvanized steel facing, combined with soil retention facing. Reinforced slope system creates structurally stable, natural looking earth retention structure form of over steepened slope. Further uniaxial reinforcement can be successfully used for slope Stabilization and / or landslide repairs. Failures or natural or man made slopes can be easily repaired by excavating and reusing the failed soil and reinforcing with layer of Polyester Geogrid. Biaxial Geogrid range is manufactured out of polypropylene by a unique punching and drawing process and provide an ideal solution for soil stabilisation, sub base reinforcement, foundation engineering and other highway challenges. Compact granular material partially penetrates over Biaxial Geogrid and projects through the apertures, which gives Interlocking action between the particles and the grid. This interlocking enables the grid to resist horizontal shear from the fill and mobilise the maximum bearing capacity of a soft sub soil. Biaxial Geogrid is engineered to be mechanically and chemically stable in aggressive soil environment and is not attacked by susceptible to hydrolysis, environment stress cracking and micro-organism attack. Biaxial Geogrid feature’s high tensile stiffness at low strains and excellent resistance to construction damage and environmental exposure. A significant saving in the fill thickness can be achieved by using the Biaxial Geogrid range of products along with the improvement of resistance towards rutting. Biaxial Geogrids are excellent for construction of access road, haul road in mines where large thickness of aggregate is lost in soft sub grades due to rutting. Railway track that overlies soft sub grade always experiences rapid and permanent settlement leading to disturbances of formation levels. Strong and positive interlocking action with the ballast, which prevents lateral movement to minimize migration of fines from sub grade. 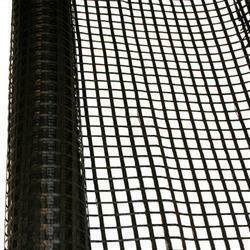 Roadgrid are specially knitted fibreglass grid ideal for asphalt reinforcement. These grids are coated with bituminous material, which ensures proper adhesion to asphalt layers. This bonding ensures that this reinforcing grid is in position to accept the tensile stresses and to distribute them. The special peel and stick feature eliminates the need for track coat and also ensures quick installation. The selection of this material is based on excellent beat resistance, minimal shrinkage at high temperature of 200°c and optimal elastic modules. It may be noted that Roadgrids are produces with aperture size 25 X 25 mm. This aperture size is based upon the average asphalt particles size available for obtaining the best results. This is the optimal aperture size to ensure the best bonding between the asphalt layers. Roadgrid is specially knitted fiberglass with bituminous coating, making it ideal for asphalt reinforcement. In resurfacing application, Roadgrid greatly assist in minimizing the reflective cracking. Roadgrid is also ideal for use in new highway construction, saving in long term maintenance and increasing roadway life. Roadgrid is successfully used for the variety of asphalt reinforcement application including control of reflective cracking and rutting in asphalt concrete overlays, airport runway, road, parking lots, jointed concrete highway and other uses. Geogrids are high strength oriented polymer grid structures used to reinforce soils & are made from high Tenacity polyester yarns, when coated with Poly Vinyl Chloride they make a strong, durable & dimensionally stable geogrid. Our product is highly recommended for reinforcement of soils & other granular materials for a wide variety of applications including soil retaining walls. Maruti Geogrid™ has good tensile strength, low elongational ratio & high occlusive force with soil or gravel which is ideal for soil reinforcement purposes. Maruti Geogrid™ is resistant to UV rays, bacteria attacks and aging resistant &has a product life of about 75 to 120 years. » High static and dynamic load carrying capability. » Low material and installation costs. » Effective utilization of land. » Pleasing appearance-panels maybe given a variety of architectural treatments. » RE walls distribute loads over compressed soils, reducing the need for deep foundations. » Ease and speed of installation-Prefabricated materials and granular soil simplify construction.